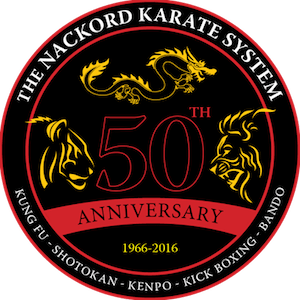 With over forty years of professional karate training and teaching experience, Mr. Nackord teaches from his home school in Wayne, PA. He has contributed to the opening of over 20 schools in his career and has promoted close to 150 black belts in that time. He began his training in his birthplace of San Francisco in 1966 and credits four men as his teachers. Mr. Nackord states, "The founder of American karate, Ed Parker (deceased), uniquely taught an understanding of the principles and relationships of movement, expressing them in terms clear to his students. 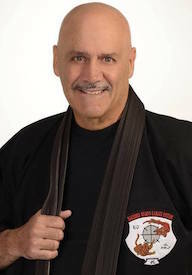 Eight-time world heavyweight karate champion and the first American kickboxer, Joe Lewis, teaches an understanding of strategies and attitudes of fighting learned only from his vast experience. World champion boxing trainer, Marty Feldman, teaches skills and realism found only in the art of boxing, and I consider him the best puncher I have ever seen. And, the internationally known person who first brought kickboxing to the United States and founder of the American Bando Association, Dr. Maung Gyi, teaches the true combative, healthful, and spiritual aspects of the martial arts possessed by few instructors today. Dr. Gyi is currently a mentor to many of the foremost martial artists in the world." Mr. Nackord has studied American, Chinese, Japanese, Burmese, and Okinawan forms of martial arts. In his teachings he emphasizes that the principles underlying a movement are far more important than from what form or style it comes. This is because proper principles run as a common thread throughout all good styles. "One must look for what is similar in styles to properly learn about movement." The Nackord Karate System teaching methods are unique, effective, and time-tested. Although our methods retain all the important aspects of a traditional teaching system, the NKS methods have been Americanized. In place of a rigid, dogmatic approach to teaching, the NKS methods rely on an understanding of modern day situations and environments, while using practical demonstration and familiar nomenclature. With over 40 years of experience our methods of teaching have been proven over and over again to produce highly skilled and knowledgeable students.